Mollie Rose (Silano) Scaia of Torrington, 98, passed away peacefully at her home on February 7, 2019, with her devoted children and caregiver, Nadine, by her side. She was just two weeks shy of her 99th birthday. Mollie was born on February 24, 1920, in what was then, Harwinton, CT, to Luigi and Giuliette (Deanzeris) Silano. She was the beloved wife of the late Geno Scaia. A 20-year employee at the Broad Street Plant of the Torrington Company, she retired in 1980. 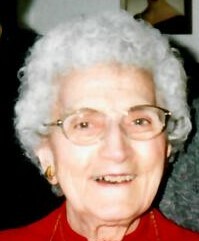 In her younger years, Mollie enjoyed dancing, playing cards, and entertaining friends at her home on Saturday evenings. She was a founding member of the St. Frances Cabrini Society at St. Peter Church and a devout Catholic. Mollie is survived by three children: Roberta Scaia and her dear friend Michael Conway of Plymouth; William Scaia and his wife, Louise Basso; and Mary Scaia; her two grandchildren: Jennifer Scaia and her husband Christopher Piedescalzo; and Christopher Scaia; her niece, Julia Maraia, and several nieces and nephews. She was predeceased by six sisters and a brother: Mary Maraia, Mae Moscaritolo, Rose Capra, Michael Silano, Lena Rinaldi, Antoinette Verlato, and Pasqualina (Pat) Previti. Funeral services will be held on Thursday, February 14, 2019, with the cortege leaving at 10:30 a.m. from Cook Funeral Home, 82 Litchfield St., Torrington, to St. Peter Church, (St. John Paul the Great Parish) 107 East Main St., Torrington for a Mass of Christian Burial at 11:00 a.m. Burial will follow at St. Francis New Cemetery. Visitation for relatives and friends will be Thursday morning from 9:00 a.m. to 10:30 a.m. at Cook funeral home.